If you are planning to design and construct a new data center or just renovating your old data center, there are some things that you need to keep in mind in order to be sure that your data center is functional and runs efficiently. Making sure that your data center design is well organized and operational is imperative to its overall contribution to your business. Planning ahead for your data center project can bypass possible major mistakes in the days ahead. Consider possible problems that might occur and figure out what to do about them now, before they happen. Also, keep your data center design plan simple. Simplicity is the key to organizing your data center in a user friendly fashion. When and if a problem should arise, you will know exactly where everything is and where to go in order to fix it. Make sure that you leave room for adjustments and flexibility. As new items come and old ones are replaced, there needs to be room for rearranging within your data center room. You should be able to arrange your equipment in a fashion where upgrades are easily accessible. Using standardized measurements and sections will also help to make constructing your data center much more easily. The data center design should include shelving that is uniform so that adding more servers is as easy as adding more standard shelving. Knowing how everything fits together also simplifies the process. 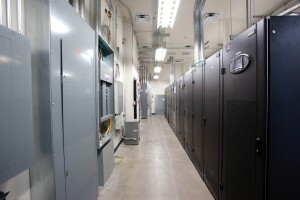 Because of the enormous weight of the various servers and computerized equipment, it is imperative to have flooring and structures that will hold up under extreme weight. Thinking of this now and not waiting for a problem to occur, such as a floor caving in, is crucial in ensuring that your data center will have a long life. Although ceramic or plastic tiles might crack or give under the weight of the servers, aluminum tiles are great at holding the weight and standing up under pressure. Aluminum is the perfect flooring material to use in a data center design. One of the most important aspects of your data center is labeling each piece of equipment and the cables that are associated with them. Taking the time to label these things now can save you from extensive problems later on. With a clear label on everything in the data center, it will be easy to spot your items as well as easy to fix if a problem should arise. Make sure that you keep your data center clutter free. The center should only contain the servers and equipment that is required to be in there. Keeping the room clear of other items and debris is imperative in allowing the room to be functional and easily accessible. Messy and cluttered rooms can lead to accidents and problems as well. It is much easier to keep it clean. In order to ensure that your data center design includes all of these important aspects, you will want to make sure that you hire the right company to construct your data center. Insist that the company you hire holds a data center specialty license. This specialty license is needed to ensure that the company has the necessary training and experience in building exceptional and functional data centers. This entry was posted in computer room construction, Computer Room Design, Data Center Build, Data Center Construction, Data Center Design and tagged computer room build, computer room construction, computer room design, data center build, Data Center Construction, data center design. Bookmark the permalink.